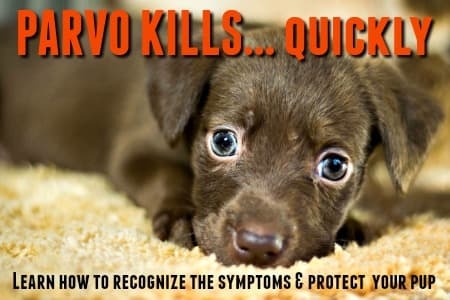 Dog hair removers, essential anywhere Fido calls home! I've owned dogs, and consequently fought the Dog Hair War, for decades. It's not a war that's easily won, and battles are fought on all fronts... bedding, furnishing, clothing, car seats and more. But, I've finally found three dog hair removal tools that have all but eliminated those pesky dog hairs from my home, car and clothes - and they don't involve those annoying sticky sheets either. I can't imagine how many of those sticky sheets are in landfills across the country (or world even), NOT a very eco-friendly option in my view! So, without further ado, here are my personal reviews of three pet hair removal products that actually do what they're designed to do. If you have a cat who sheds like crazy (and yup I do, a big, chunky orange one) you'll be glad to know that they work equally well on cat hair!. I figured I'd start off with the big guns, and after scouring Amazon for possibilities I zeroed in on the Ugle Duckling of pet hair removal, the Fur-Zoff Pet Hair Remover. The tagline is right on the money.... and at just under $12 I figured I couldn't really go wrong. Plus, it's a one-time deal. Okay, maybe it'll need to be replaced at some point, but given how many sticky sheets I currently use on a weekly basis, it's got to be easier on my wallet! So, Fur-Zoff arrived (Amazon Prime is definitely on my list of things I love! ), and yes, I can vouch for the fact that it's not pretty. It's like a hand-sized chunk of gray/black volcanic stone, but hey, I didn't buy it for it's looks. 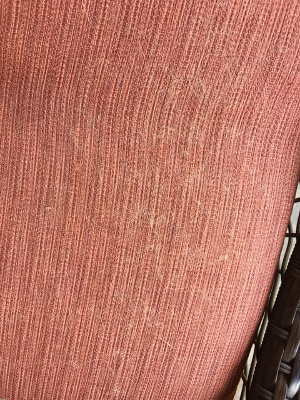 Our patio furniture cushions are the favorite sleeping spot for a stray cat with thick orange/white fur and I've been dying to do battle with them properly. The Fur-Zoff did not disappoint. Every stroke picked up the hair and after a few strokes the loose hair kind of formed into rolls which were easy to pick off the cushions, some was stuck to the Fur-Zoff but not much. Far less than I had expected actually. I cleaned and de-furred the love-seat and two chairs in a few short minutes. 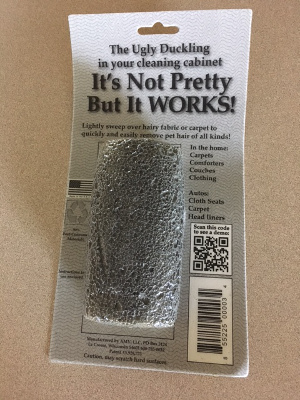 I didn't have to rip off a hair-covered sticky sheet every 5 seconds either! Next I decided to tackle the kitchen door mat which stubbornly collects a LOT of dog hair. A few strokes and the difference was amazing. Much as I love the Fur-Zoff, it does have one drawback.... its' surface is rough and I wouldn't recommend using it on thin/delicate fabrics as they may get snagged. Also bear in mind that it's a hard, rock-like thing and could scratch wood so be careful when using it on furniture with wood trim or rugs set on wood flooring. NOTE: Although most of the cat/dog hair kind of rolled itself up and was easy to remove, some did stick to the rocky Fur-Zoff. However a quick wash under running water (I used the spray attachment to the faucet but running water also worked just fine) and leaving it to dry made it good as new. 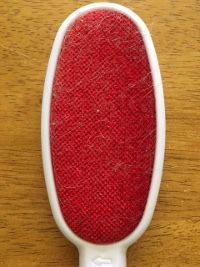 I totally love Fur-Zoff, but it's a little too abrasive to use on certain fabrics, so I went in search of a pet hair removal tool that would be a little more gentle, yet still effective. And I found rubber pet hair removal brushes (click HERE to see what I mean). These brushes apparently come in a variety of different sizes, shapes, and colors. Some are designed to be used close up, for clothes/furniture etc. Others are broom-length for use on floors. Some manufacturers combine rubber brush 'bristles' with a glove to make a 2-in-1 tool pet hair tool which grooms, removes pet hair and massages all at the same time... but these are better used ON your dog, rather than to remove the hair which has already left him behind. As they're totally reusable, over and over again, this is a bargain. How does a rubber brush remove pet hair? With a simple electrostatic charge. The rubber bristles create said electrostatic charge when they're brushed over fabric/upholstery. 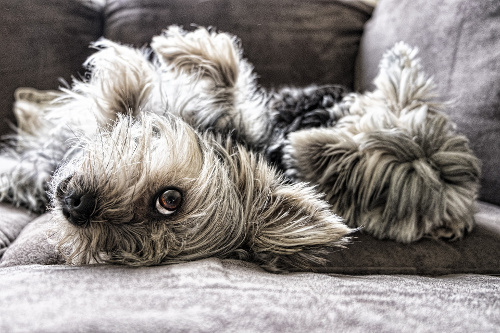 Pet hair is attracted to the rubber like metal filings are attracted to a magnet. .. and voila, it lifts right off the fabric, carpet or whatever it's stuck to! I ordered the SM Arnold 25-600 Professional Rubber Pet Hair Removal Brush. 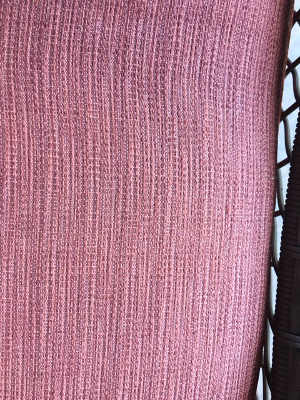 Again, Amazon Prime delivered quickly, and armed with my rubber brush I tackled the bedroom curtains, family room sofa cushions and throw pillows, and the seats in my car (both fabric and leather portions). The brush performed well, gently but firmly removing the hair from most items I tried it on, although it didn't always pick up the hair as much as lift it free of the fabric. This wasn't a problem as it was easy to use swipe hair into a pile using the brush, then pick it all up in one go. The effectiveness of the bristles did vary some according to the fabric or surface I was using it on. The thicker and more durable the fabric, the better it worked. It was a star on my car seats, door mats and upholstered furniture, but not as effective (and just a little rough) on lightweight bedding or clothes. Another way of enhancing hair pick up was to dampen the brush (which enhances pick up) or dampen the fabric with a spray bottle of water. Brush can be washed under running water with a little mild soap to remove any lingering 'stuck on' hair. So, about that.... um no thank you! I had not noticed this warning on the purchase page, and as soon as I saw it on the actual brush I decided to use rubber or latex gloves to run the hair removal tests (and wash my hands thoroughly afterwards just to be safe). However, there are many other similar rubber pet hair removal brushes which do not have this warning. They're equally effective and, in my opinion anyway, much safer. Velour Hair/Lint Remover - A Workhorse! 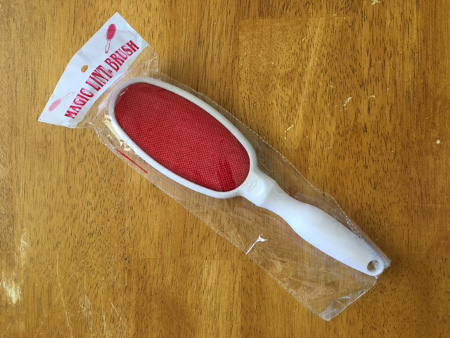 My third, and final, review of dog hair removal tools is of the simplest, 'old-school' type of hair/lint remover - a velour brush. I remember using these decades ago, before the annoying, UN-eco-friendly sticky-lint-rollers appeared on the market. Having tried these simple, but super effective, pet hair removers again, I can't imagine why I ever stopped using them! 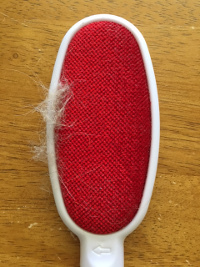 The Fur-Zoff and rubber brushes make short work of dog or cat hair on just about every household surface, and car interiors, but neither were excellent at removing dog hair from my clothes. Enter the velour lint remover brush! There are dozens of different takes on the same basic principle - a plastic (or occasionally wooden) brush, which has a red velour surface instead of bristles. There's a strong 'nap' on the velour fabric which is what removes the hair (or lint). 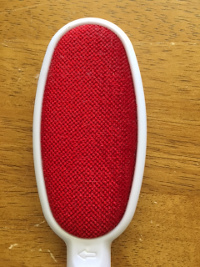 Swipe it one way (against the nap/grain) and the fabric picks up hair, swipe it in the opposite direction and it releases the hair. And yes, if you swipe it the wrong way on your fabric you'll put that hair right back! Zelta Magic Lint Brushes have an arrow at the top of the handle which shows you which direction to swipe the brush, very useful and prevents you having to check the direction of the nap every time with your fingers. These brushes are double sided making them easy to use by both right, and left, handed people. Personally I find the easiest way to remove the hair from the velour is to use damp fingers and swipe them over the brush in the direction of the nap/grain. The hair collects/bunches and you simply remove it by hand. Easy-peasy... and the brush is as good as new again, literally. If you don't want to touch the hair, then run the brush the wrong way on a piece of soft paper towel, or a scrap of fabric (old denim works well) or something similar. There are so many different designs, sizes, styles and manufacturers of these velour lint brushes that you'll be spoiled for choice. From my research and testing, there is very little to choose between them. If you want a smaller brush that's easy to put in your purse or take on your travels, then one of the Mini or Foldable options would be a good choice. There are brushes with pop-up/multi-directional heads or swivel heads, comfort-grip handles, or non-traditional colored velour and handles. 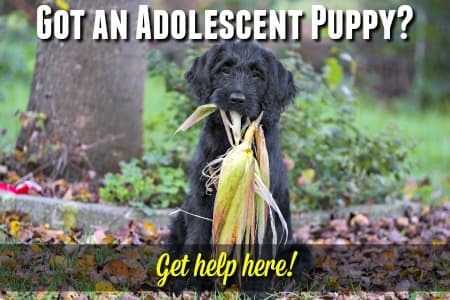 There's something for everyone for sure. So, that completes my reviews of the best dog hair removers.